Below is a list of our suggestions for places to visit in Kyoto during cherry blossom viewing season; definitely the best place to see cherry blossoms in Japan. When you visit the area during April-May, you wouldn’t want to miss the beautiful sights of rows-and-rows of Cherry blossom trees in bloom. My personal suggestion is to aim for the end of the season when the cherry petals float through the air and elegantly dance their way to the ground. This is a phenomenon that is often alluded to in classical poetry, and that captures the Japanese preference to savour beauty not at its prime, but in the transitional periods. The coming of spring, the falling of cherry blossoms. An allusion to the fleeting and ever-changing nature of our lives. Sunlight calmly brightening this quiet Spring day. Yet why do the cherry blossom petals so restlessly continue to dwindle down? The ‘Kyoto Gyoen’ garden surrounding Kyoto’s imperial palace offers visitors kilometres of cherry blossom viewing opportunities. Because the area encompassing the palace is so vast, paved with broad roads, it provides sufficient places to picnic or hold a small tea ceremony under the trees. This garden presents around 1000 trees of several cherry varieties to admire. But it are the elegant weeping cherry trees at the north-end of the garden that are the prime highlight. Best time to visit: late May to early April. Access: 10 min from Subway Marutamachi station or Imadegawa station. 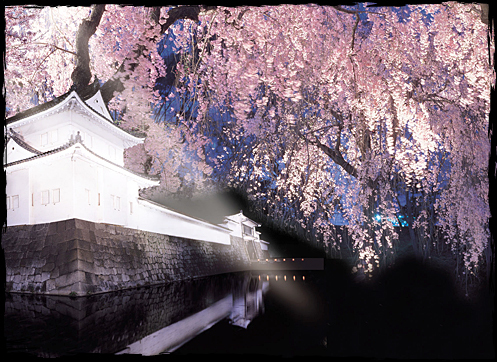 Click here for more information on the Kyoto Imperial Palace. Throughout approximately the last week of March and the first two weeks of April, evening light-ups are organised at the castle. These light-ups put the approximately 400 trees of 50 different cherry species in the spotlight. Certainly the best place to see a unique variety of cherry blossoms in Japan. The light-up begins after dark from around 6pm and can be visited until 9:30pm. The Admission for adults is JPY 600, high school children is JPY 350, and elementary school children is JPY 200. During the day the castle organises several stage events and small local market fairs. However, beware that during this busy touristy season you may have to line up at the entrance. Click here for more information on Nijo Castle. Alongside its bedding the river is lined with Cherry trees. The northern area upstream the river is the most popular spot for cherry blossom viewing because here it is flanked with very large cherry blossom. The Nakaragi no michi is one suggestion that falls under this category. The river is freely accessible and is often frequented by cyclists, joggers, and people who seek a relaxing place to train in the martial or musical arts because it is so quiet. This makes it the perfect spot for a relaxing stroll under the cherry trees. 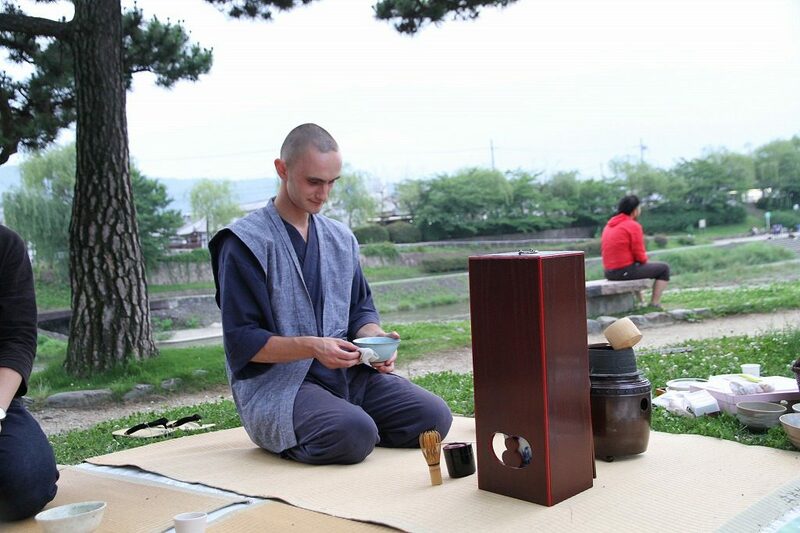 It is also the perfect place for a casual outdoor tea ceremony. The delightful scent of the cherry blossoms carried by a fresh spring breeze, perfectly complements the gentle aroma of a bowl of carefully whipped tea. Best time to visit: late May to early April. Before noon. Similar to the kamo riverbank, the Yodogawa riverside too offers great cherry blossom viewing opportunities. The best place to see cherry blossoms here is in Yawata, just south of Kyoto city. During cherry blossom season locals and tourists alike gather together under the cherry trees to enjoy the first moments of this year’s spring. Here you will most likely be able to see the cherry blossom festival as it is maintained contemporarily. Select groups of people, often families, colleagues, or friends gather together on a blue plastic sheet, while they joyously have a picnic and some sake. Best time to visit: late May to mid April. Opening hours: 9am to 5pm. Access: 40 minutes by train from Kyoto station. 10 minutes by foot, north of Yamata-shi station on the keihan line. 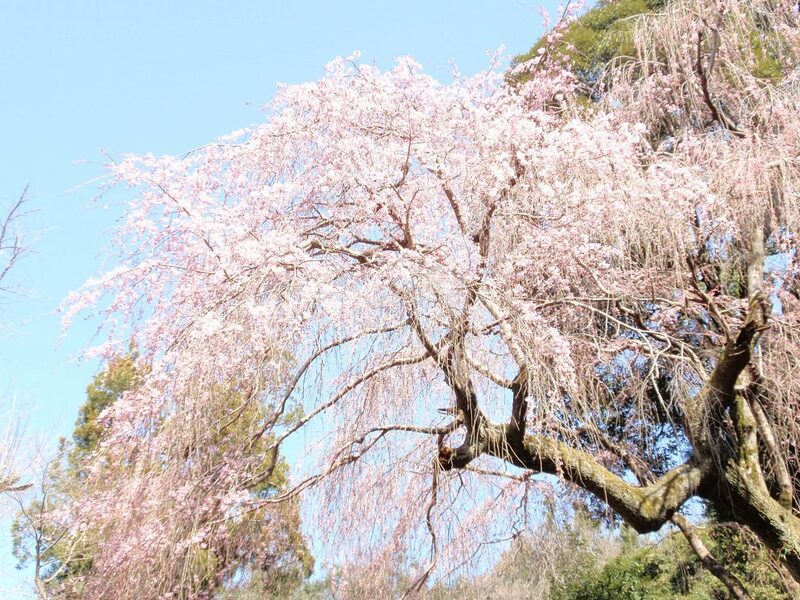 The Kyoto Botanical gardens is the best place to go to for people who truly wish to adorn the most beautiful sights of the cherry blossom trees in bloom because It houses a little forest of various Cherry tree varieties. The main attraction is the grand weeping cherry in the centre of the garden. The variety of species in this garden is immense. This means that some of the trees bloom earlier and others later. 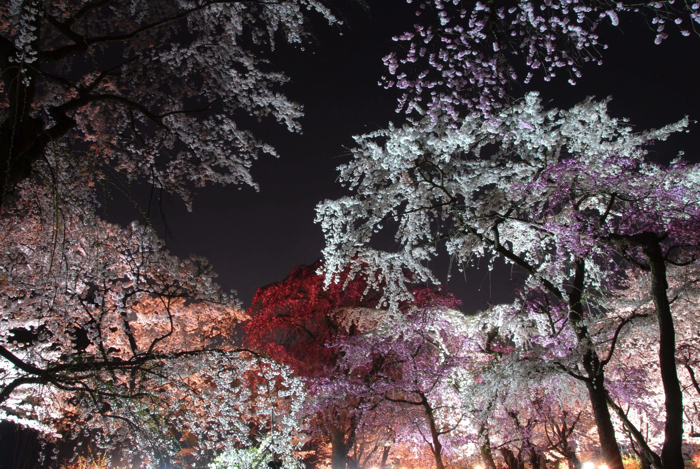 The botanical gardens are therefore ideal for visitors who come during the last weeks of the cherry blossom season. This garden will then still be able to exhibit a few very beautiful trees in their prime. Access: Walking distance from Kitayama Station on the Karasuma Subway Line. Nakaragi no michi is a path alongside kamo river, which is very near to the Kyoto botanical gardens. 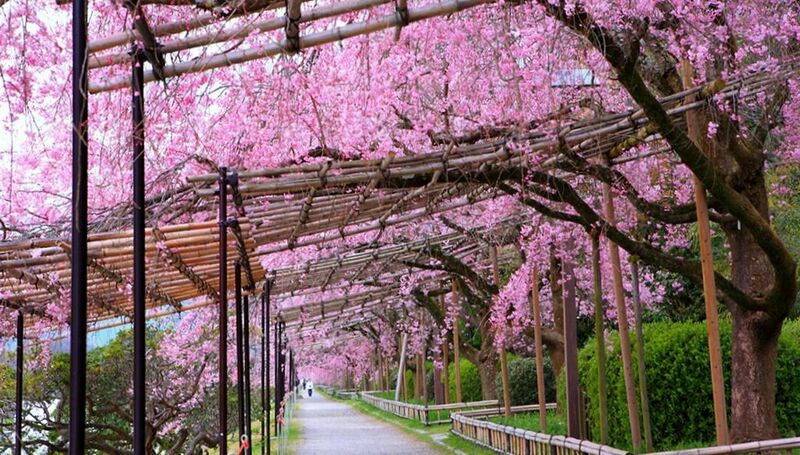 Its most scenic view is for example a row of bright pink weeping cherry trees is sheltering this path. It is therefore a true pleasure to stroll underneath. This place is perhaps one of the lesser known places visited by tourists, therefore making it one of the best places to see cherry blossoms in Japan. Access: 10 minutes on foot from Kitayama subway station. 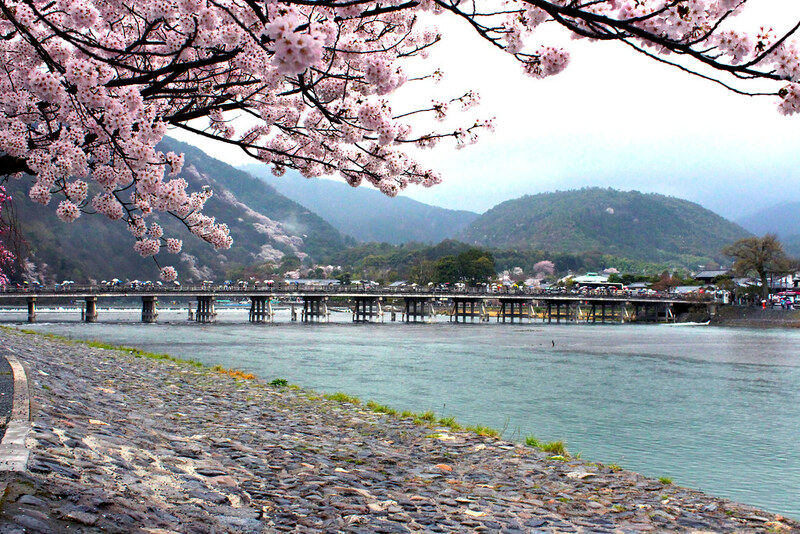 Arashiyama is an all-season favourite because of its scenic views of the mountains. 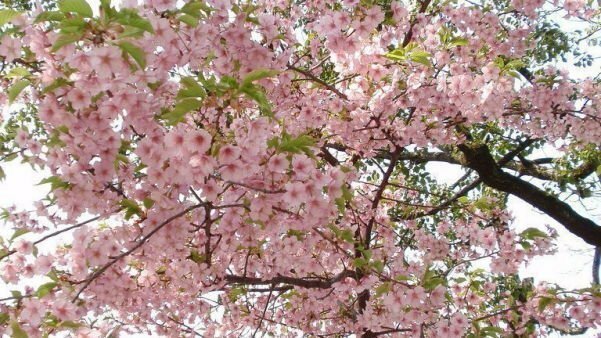 But it is most visited during cherry blossom season and in fall when the maple leaves turn bright red. This is because both occasions not only offer the visitor an opportunity to see a few beautiful trees. Visitors are in fact presented with whole mountain-flanks coloured in pink or bright-red. 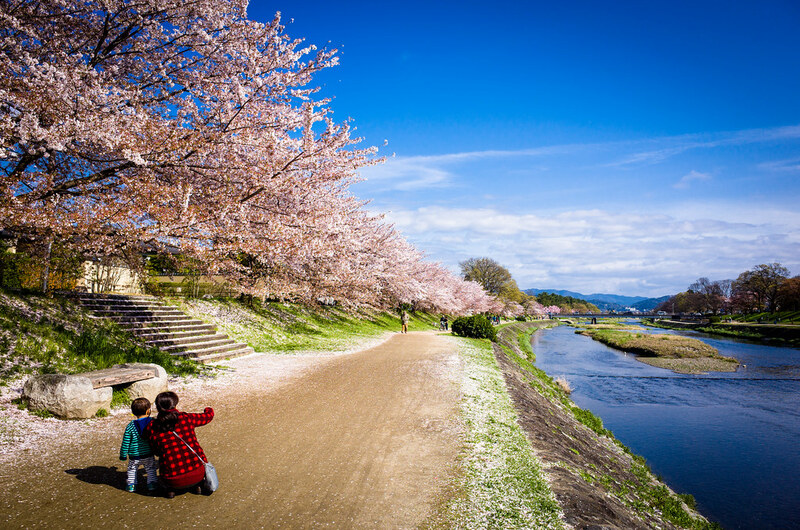 The area around Togetsu-kyo and Nakanoshima park would be the place to begin your discovery of Arashiyama because it offers the most beautiful cherry blossom sights. 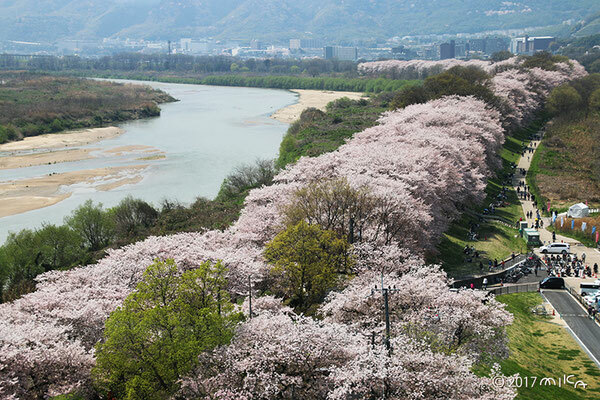 The riverbank offers visitors the opportunity to see the Cherry blossoms close-up, while from atop or across the bridge the mountains surrounding the area present you with a sight available only here. Should you wish to take your excursion a bit further, then the Daikaku-ji temple on the outskirts of Arashiyama. The temple’s pond is a particularly popular spot for blossom viewing because its large pond is circumvented by beautiful cherry blossom trees. Additionally, the area also proposes two unique, yet slightly my touristy, activities worth considering. The details are as indicated below. Best time to visit: early April. Illumination: during blossom season until 22:00 in Nakanoshima Park. Access:　15 minutes from Kyoto Station to Saga-Arashiyama Station on the JR Sagano Line. Click here for more information on Arashiyama. During the 18th Century heavy transport was commonly conducted on water. The Hozu river was a popular transportation route for wood and logs, because they were needed to build many of Kyoto’s and Osaka’s temples, shrines, castles, etc. Also rice and other products were carried over the river by boats. These boats had to be pulled upstream once the delivery was completed, which was an arduous task. Due to modernisation, trains and land-transport became easier and made river transport unnecessary. Today they have lost their original function, but they remain a popular sightseeing attraction. 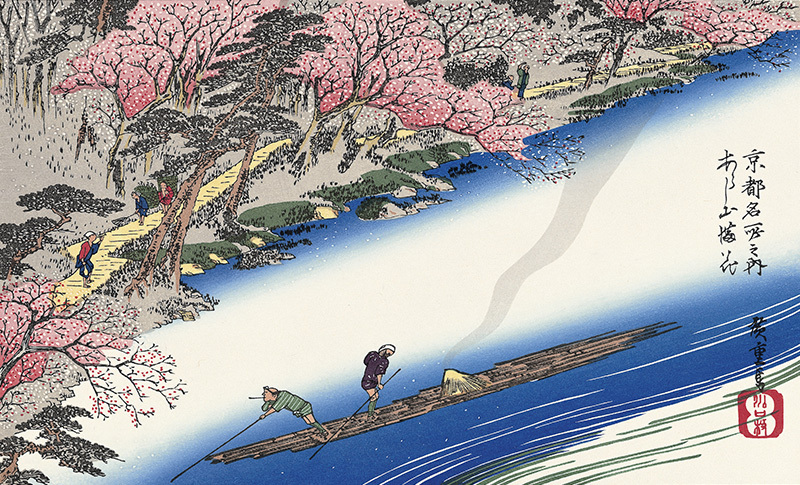 The boat ride on the river from Kameoka to Arashiyama takes about two hours, and provides the visitor with sights he would otherwise not be able to enjoy. Skilled boatmen operate the boats and use bamboo poles to direct its course in the rapids. This cruise is a great recommendation if you’re looking to relaxedly enjoy some of Kyoto’s most beautiful cherry blossom sights, while being carried along on the gently swaying river. Access: 10 minute walk from JR Kameoka Station (20-30 min from Kyoto station). Click here for more information on the Hozu river cruise. The Torokko is a romantic sightseeing train line that runs along the Hozugawa River between Arashiyama and Kameoka. It is a truly unique experience because of the old steam engine that pulls several old-fashioned railroad cars along some of the most scenic sights in the mountains along the river. The slow-paced train keeps passengers engaged with idillic view after view during a 25 minute relaxing journey. This is a great opportunity to for a moment forget the bustling business of life, and doze off in the mysterious beauty of mother nature. You could combine the train ride with a return over the Hozu river taking the river cruise. Or if you prefer the train, you may get a return ticket in order to enjoy the same views from a different angle on your way back to Arashiyama. Entrance fee: JPY 620 one way. Click here for more information on the Sagano Scenic Railway. While the endless lingering of everyday affairs pains me deeply, I rejoice in the swiftness with which the blossoms fall not leaving a single trace.